Deliverable D34.1 is related to Athens Demonstration: Sewer Mining for Urban Reuse enabled by Advanced Monitoring Infrastructure. 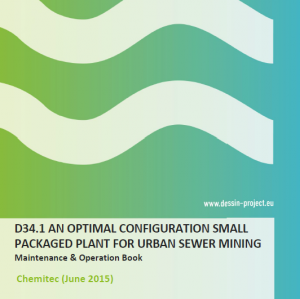 More specifically, D34.1 focuses on the installation of a small footprint packaged treatment plant. A packaged plant consisting of an advanced Membrane Bioreactor coupled with nano-filtration and reverse osmosis membranes has been installed in KEREFYT, the Sanitary Engineering Research and Development Center of EYDAP in Greece. The installation simulates direct abstraction from main sewers and is able to accept multiple types of effluent (municipal and industrial), also linked to the Metamorfosi wastewater treatment plant. The reclaimed water is appropriate for irrigation purposes and will be used to irrigate the surrounding urban green area. This document aims to serve as the Maintenance and Operation Book of the proposed solution.